A big picture thinker, I also love to map out all of the details needed to make the project come to life, and find the right person for each task. In order to create a post-earthquake success story in Rainaskot, we had to plan the project to fulfill the wishes of the villagers for their future, consider environmental, economic and cultural sustainability, and make the buildings earthquake safe. All the while, we wanted to be good stewards of donor funds by having all of these priorities fulfilled at as low a cost as possible. I was tasked with overseeing this conversation while allowing the Nepal team, especially our engineers, to have the most say in how we proceeded. Consult with a variety of experts in sustainability both in the US and Nepal, reporting my findings to the team and villagers for possible inclusion in the plan. Our results: We were the first permanent rebuilding project to start work in Nepal. We were not the first to finish, we can say that the homes are very well-constructed, and they preserve some flavor of the traditional village home. Our main economic plan for the village was to incorporate a B and B style guest room in each house (known in Nepal as a homestay). This plan has been a resounding success, with over 4000 guests staying in 14 guest rooms the first year. Still from a video about Bimala Bhujel in Rainaskot. With her cooperation, we were able to tell the story of her life and the difficulties she faces. This video helped us to raise the funds needed for her house within a month. Many donors mention her by name and have genuine affection for her. Click on the picture to see the video produced in 2015. With disasters happening continuously in the US, and around the world, these events are quickly forgotten and the initial media coverage drops sharply after 3 weeks. Add to that the fact that many Americans are unfamiliar with the life and culture of Nepal. Only more ambitious travelers make it to a small country that is a days worth of flying away, and even among those, few have been to the kind of community that we are serving. 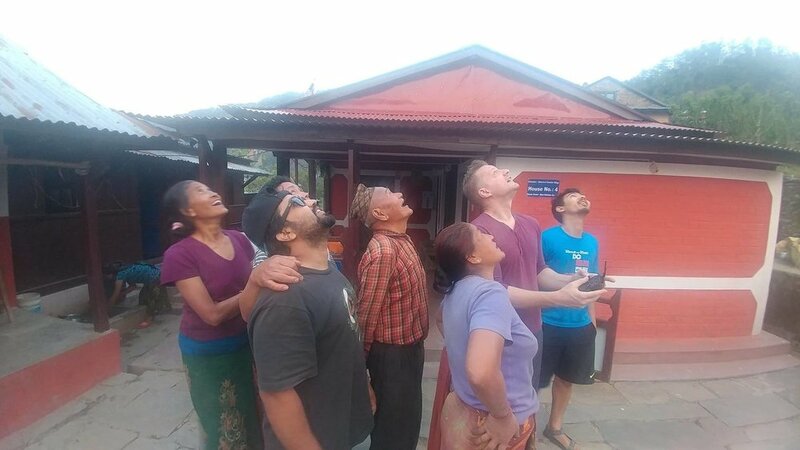 Nepal direcor Bibek K Pandit joins the villagers of Rainaskot and our US-based IT volunteer Ashish Khanal in watching NY photographer shoot drone footage of the village to share with donors.